Keto, Paleo and the low carbohydrate diet are some popular diets that significantly reduce or eliminate sugar. That’s a good thing, right? Yes and no. It depends on whether we are talking about natural or added sugars. Dairy and fruit contain natural sugars but they contribute important nutrients to our diet. When sugar is added during processing it adds extra calories without the benefit of nutrients. 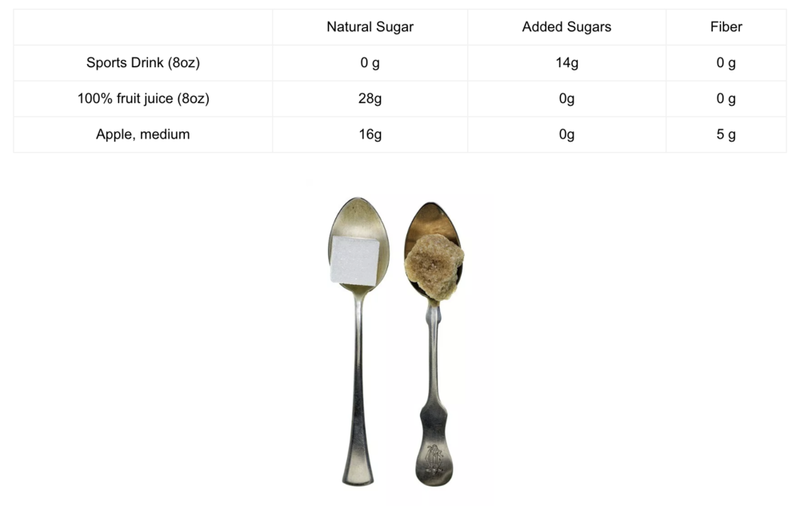 The recommendation for added sugars is a maximum of 10% of total your total daily calories. So if your daily calorie intake is 1,800 calories, only a maximum of 180 calories should come from added sugar. For example, one 16-oz sports drink provides 96 calories from added sugars. That’s half the recommended amount for the day! The primary sources of added sugars in our diet are soft drinks, sweetened coffee drinks and snacks and sweets. Fructose, the natural sugar found in fruit, is a simple sugar that is easily digested causing a sudden increase in your blood sugar. Fructose is also one of the two simple sugars that make up sucrose (i.e. table sugar). So fructose occurs both naturally in fruits and as a component in added sugars. This may be the reason many people think that fruit is bad for them. A balanced diet should include 1 to 3 servings of fruit daily depending on your calorie needs or weight loss goals. Unlike foods high in added sugars and calories, fruit contains important nutrients, disease fighting antioxidants and fiber. Fiber not only keeps your digestive track running smoothly, it also slows the absorption of sugar in your blood stream. Other great sources of fiber are vegetables, beans and whole grains. You should aim to increase your fiber intake up to 25 – 35g of fiber each day. So fruit juice is okay then? It’s not ideal. “Natural” doesn’t always mean healthy. When it comes to fruit, choosing the whole fruit instead of the juice is a better option. 100% fruit juice contains natural sugar but the fiber was removed during processing. And, it takes about three to six apples to make 1 cup of apple juice so you’re getting a lot more sugar and calories (minus the fiber) than you probably intended. Lactose is a natural sugar found in milk and dairy products. Unlike fructose and sucrose, lactose does not have the same metabolic effect on our bodies. Trying to eat foods low in sugar should not be your motivation for reducing or eliminating dairy. To reduce sugar from dairy sources, focus looking at added sugars and reduce flavored yogurts for example. Dairy is an excellent source of calcium and vitamin D (fortified). If you choose to eliminate dairy for other reasons, be sure you are getting these key nutrients from other sources. Is lactose-free milk sugar free? No. An enzyme is added to milk to break down the lactose into two simple sugars. The lactose is not removed so lactose-free milk still contains natural sugar. Don’t drink your calories. Choose beverages with no added sugars such as water, seltzer or mineral water. Portion control! Reduce the size of sweet desserts and drinks containing sugar. Tip: If you’re deciding between a banana (yes-it’s very high in starch) or ice cream – go with the banana!